Autumn work on the farm and autumn in the city are so very different, yet vaguely similar. Here's a few things I found in common -- sort of. I also wrote a poem about how I'm feeling about this autumn. 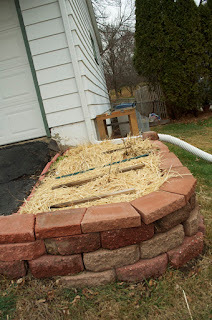 Empty herb bed and missing rain barrel. On the farm, getting water to garden and animals was literally a matter of life or death for flora and fauna. We had hoses stretched out to barns and gardens from spring through autumn. But as temperatures threatened a sustained freezing or below, we drained hoses and stored them in the barn to prevent bursting over winter. In the city, we cleaned out the rain barrels, reinstalled the downspouts and drained 25 feet of hose. My dad spent autumn days harvesting corn and prepping fields for the crop the following spring. My brothers and I helped clean out the garden, heap dead plant material on the compost pile and cover the beds with mulch. With the exception of scale, this is largely what Jay and I did on one of the last nice weekends of the autumn. We cleaned out our community garden bed, and at home, harvested all our herbs, ripped out the annual flowers, chopped down the perennial vegetation such as lilly, iris and hosta leaves. The leaves and stems of the very prolific wave petunias would have overwhelmed even my ambitious home composting system, so we had to take them to the county compost site. The farm equivalent would have been to drive the tractor to a field and left them to compost on their own. They grew much wavier and wildly colorful by late summer. During my 13 years on the farm, five years of college and 10 years of renting, "raking leaves" meant nothing to me. They blew around the yard, off into the fields and effectively disappeared. Then I bought a house, and then I moved to Jay's house, both of which had enough tree action that the leaves couldn't be ignored. Composting leaves seems like a good idea, but they are voluminous. Last year my neighbor Randy told me that he was done raking and he was just going to mow over the leaves where they lay. "Good for the soil and good for my back," he told me. We took it a step further. We gathered all the leaves on our front sidewalk and mowed over them, back and forth, until they were leaflets. This year we got smarter and simply gathered leaves in the back yard and ground them up on the dirt. 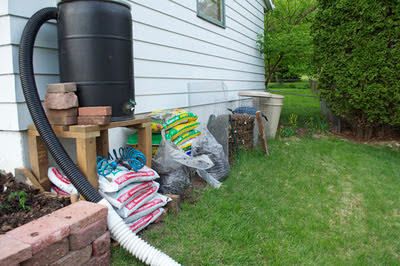 We filled two plastic garbage cans and spread the rest on the flower beds to protect the soil over the winter. The leaves in the bins will be our compost "brown" to match whatever "green" we add to our compost bins from the kitchen. 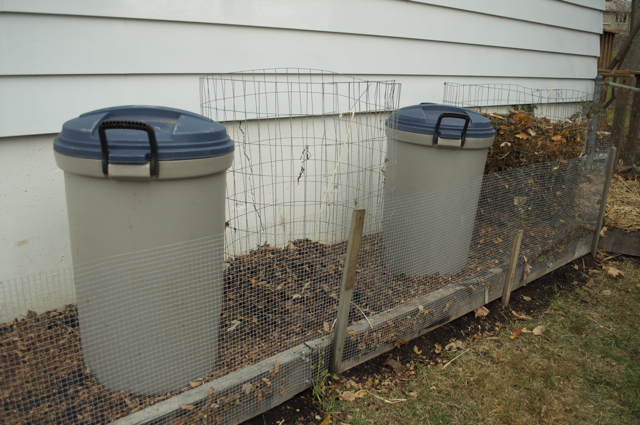 Our autumn compost bin prep includes two plastic garbage cans with tight lids full of shredded leaves. As "green" garden waste is dumped into the wire bin on the left, we'll add an equal amount of leaf material to keep the green/brown mixture roughly even. The wire bin at right is the summer's yard and kitchen waste newly chopped up under our mower and mixed with new leaves and dirt. It will be nicely composted by next spring. Trees don't just drop leaves, they drop sticks. Lots of them. I don't remember picking up sticks on the farm, but I seem to have to bend over like a duck pecking at the grass every time we mow. We store them next to the house and a couple times a year put them out on the curb. We do this in the autumn at great peril of it snowing before the city lawn and garden department comes through our neighborhood. 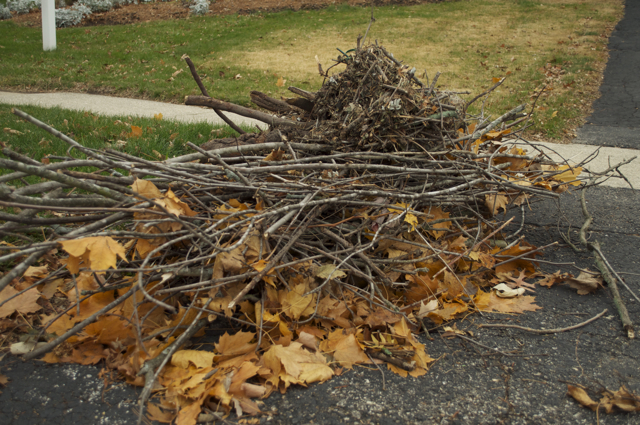 Sticks waiting to be picked up - before the first snow PLEASE! On the farm, we worked hard to winterize the house and buildings with animals. This meant staging plenty of hay for feeding and straw for bedding. In the early days, it meant putting hay bales around the exterior of the house to stop wind from blowing through the foundation. We also put away tools and machinery and moved animals to winter quarters. 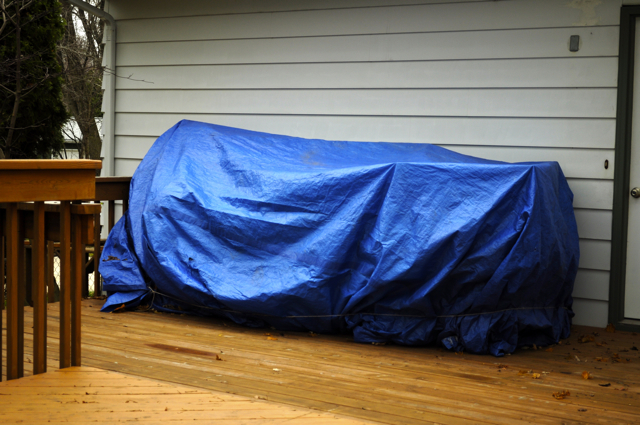 In the city, we put our lawn furniture under a tarp. Not terribly romantic :) How do YOU prepare, both physically and mentally, for winter? I'm no poet, but the idea that follows came to me today as I moped around the lawn. And I, I, I am bored. I created a video of the garden clean up day. The content is self-explanatory. Except for Uncle Max. 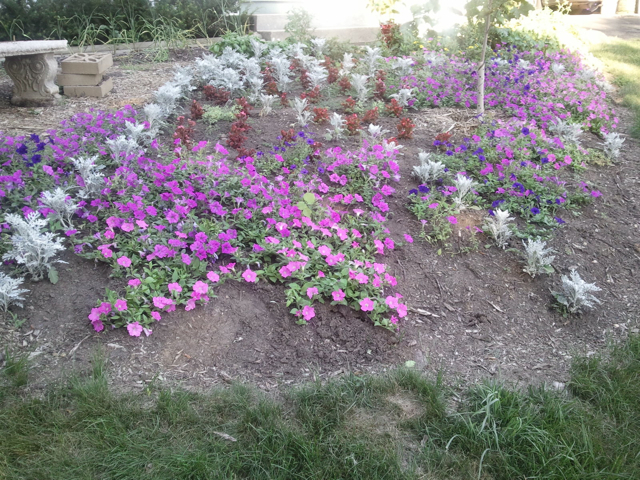 I decided to amend our beds this autumn and let the soil mature over winter. My co-worker not only offered aged horse manure, but also to bag and deliver it to work! My neighbor burns wood and gave me a bag of ash. And we planned to top the beds off with compost from a huge pile at work. 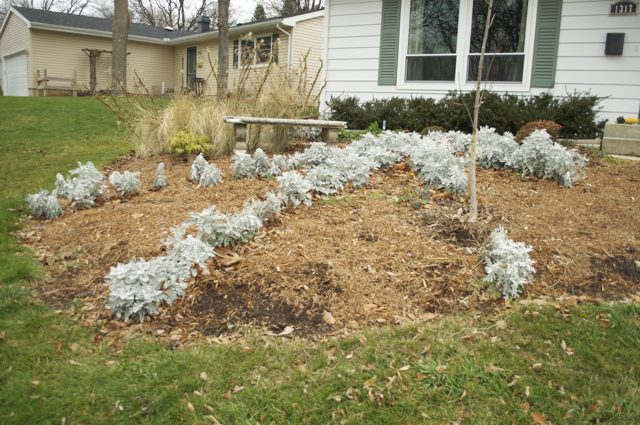 After cleaning out plant material and removing this summer's hay mulch, I started to spread a light layer of ash across the beds. As I sprinkled the ash Jay said, "There goes Uncle Max." One of the weeding parties was within earshot and my friend LeeAnn looked up and remarked, "Uncle Max? Should't we say a prayer or something?" Oh my did we have a giggle at that, and after playing it up a bit, we fessed up that the ash came from a tree. Not to let another opportunity go, as we started to spread out the horse manure, Jay said, "There goes Bessie." By now we were verging on sacrilege, and LeeAnn played along and asked, "Bessie?" Thanks Jay and LeeAnn for the laughs, you can see the smiles on our faces, they didn't go away for quite some time. The following is a small version of the video, but due to text in the video, it's best watched on YouTube. 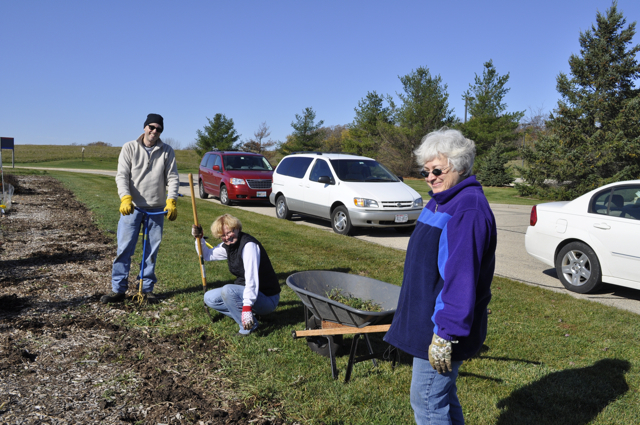 While gardeners were welcome to clean out their personal plots at any time, we planned three community clean-up days when we could work at the same time, get to know one another, and do some community work together. 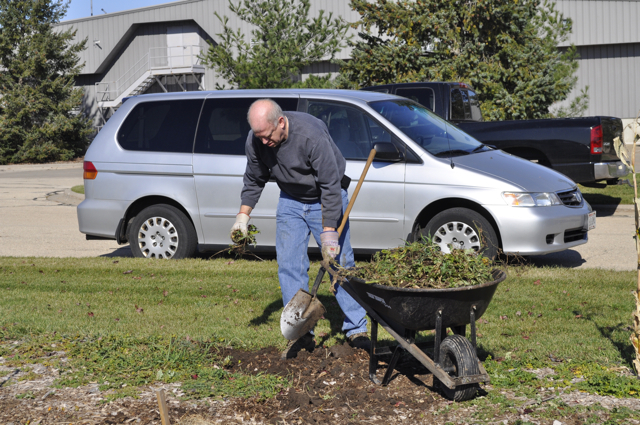 Several people from our small garden committee volunteered to organize work parties during the second community cleanup day, Saturday, Oct. 29. 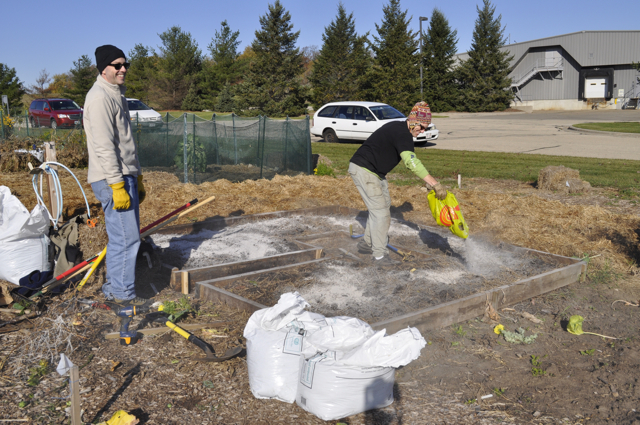 We had three main things to do: weed the common paths, move a compost pile, and winterize the rain barrels. In my opinion, there was an even bigger task to do, start building community among a rather disparate group of gardeners. Jay and I arrived around 8:45 a.m., and there were already people digging weeds out of the paths. Our thin layer of mulch was no match for the surrounding weed pressure, and at first, the weeding task was ominous. I had previously joked with my fellow committee members that I was going to sneak out to the garden at night and spray the weeds with Roundup. However, as the morning sun rose, more people arrived and before I knew it there were people in different parts of the garden weeding and carting compost. Jay and I had more than three things to do to get our plot ready for winter and next spring: restake the bed boards; clean out the old plant materials, amend the bed with ash and horse manure, fill any remaining space with compost, and plant the garlic. Jay pulling marigolds and me pulling tomato cages. While Jay and I worked on the bed, I looked up once in awhile to see the weeding crews moving down the paths, the compost pile getting smaller and the picnic table get loaded up with snacks. 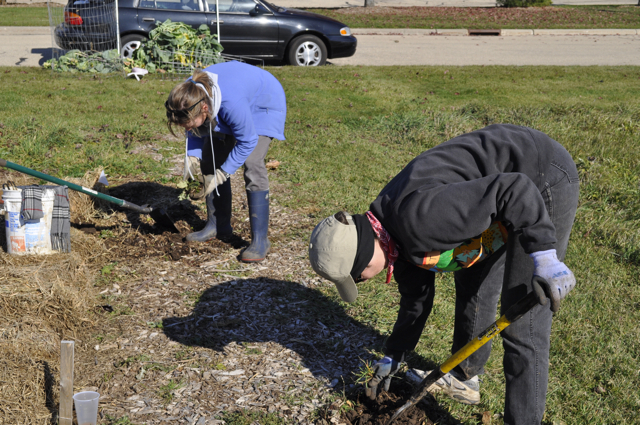 Eventually I started to get self-conscious that we hadn’t yet put effort into the community work, so Jay and I left our project, grabbed spades and joined a weeding party in the fruit tree area. We chatted with people and dug out the thistles and other weeds that had crept in from the field around our garden. We talked about our successes and challenges of the summer, remarked on the absolutely splendid day we had for working outdoors, proposed various ways to ensure the weeds aren’t as much of a problem next year and got to know one another better. My cousin Tracy arrived with her small sons. 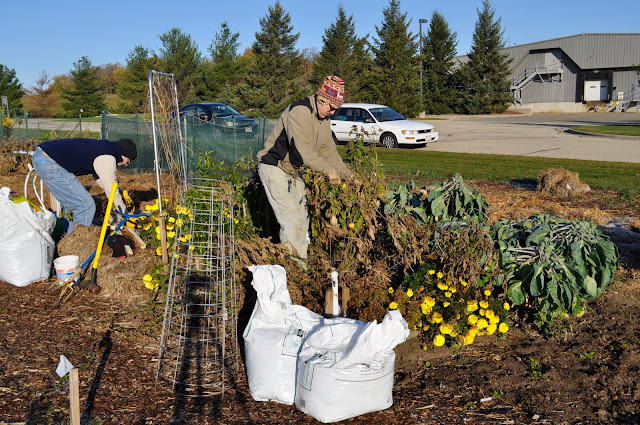 She works at a General Electric plant in Madison, and is helping expand a community garden there, so she wanted to see what our garden was all about. Fortunately, the two women who spearheaded our community garden efforts were both working in the garden and I introduced them to Tracy so they could talk shop. I knew it was a successful introduction when I saw them exchange business cards. I am pleased and delighted with the number of people who came to help in the garden. At one point, I counted 14 people, though I think the total number was higher because people came and went all morning and into the afternoon. I attempted to say hello to every person and to thank them for helping as they departed. When one of my coworkers departed, I said something like “It was nice to have you here,” to which he replied (in jest, I need to add), “Why? Because I was doing something moderately social?” Fair enough, you wouldn’t call this particular fellow “Mr. Social,” but no, the reason I was glad to have him, and all the other gardeners there on a Saturday morning, was because they contributed to one half of the formula that makes up a community garden. 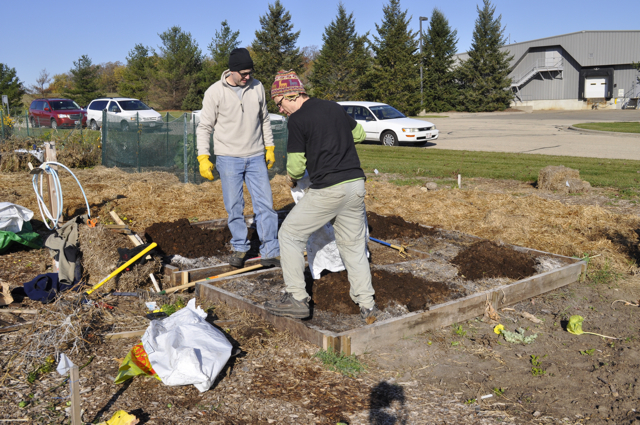 The gardening for the year was done, but we were all there for the community. Very very cool.